There are No HOLES in our belts. 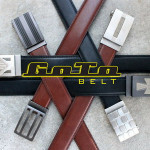 GoTo Belt manufactures the Best Fitting Belts you will ever wear. Unique buckles and belts with micro adjustable track instead of holes. You'll never want a regular belt again. Fits your waist perfectly, every time you put it on. Proudly designed in the USA.